Genu Varum is also known as Bow Leg. It is a deformity wherein there is lateral bowing of the legs at the knee. This is usually due to defective growth of the medial side of the epiphyseal plate. It is commonly seen unilaterally and seen in conditions such as Rickets, Paget's disease and severe degree osteoarthritis of the knee. 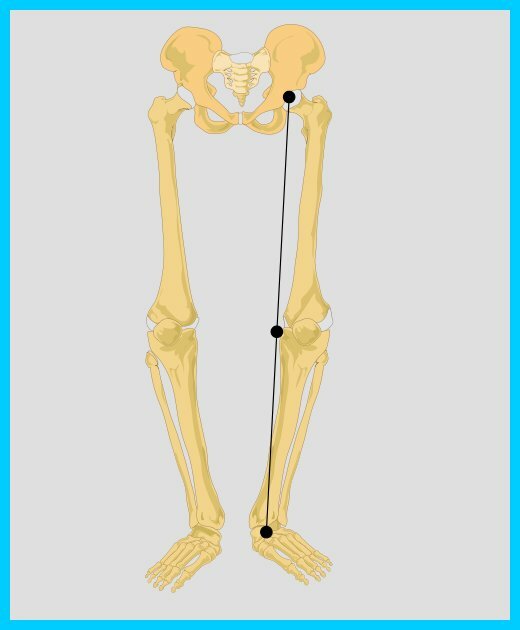 The degree of deformity is measured by the distance between the two medial femoral condyles when the patient is lying. Generally, no treatment is required for idiopathic presentation as it is a normal anatomical variant in young children. Treatment is indicated when its persists beyond 3 and half years old, Unilateral presentation, or progressive worsening of the curvature. During childhood, assure the proper intake of vitamin D to prevent rickets. Mild degree of deformity can be treated by wearing surgical shoes with 3/8" outer raised and with a long inner rod extending to the groin and leather straps across the tibia and the knee. Corrective operations can also be performed, if necessary. The person would need to wear casts or braces following the operation. Idiopathic tibia vara, or Blount disease, is the most common pathologic disorder producing a progressive genu varum deformity. It is characterized by abnormal growth of the medial aspect of the proximal tibial epiphysis, resulting in a progressive varus angulation below the knee. Tibia vara can occur at any age in a growing child. It is classified according to the age at clinical onset, as follows: infantile (1 to 3 years), juvenile (4 to 10 years), and adolescent (≥11 years). The infantile group is the most common; the juvenile and adolescent forms typically are combined as late-onset tibia vara, which occurs much less frequently. Etiology Although the exact cause of tibia vara is unknown, it seems to be secondary to growth suppression from increased compressive forces across the medial aspect of the knee. The characteristics of infantile tibia vara include predominance of black race, female gender, marked obesity, approximately 80% bilateral involvement, a prominent medial metaphyseal beak, internal tibial torsion, and lower extremity length inequality. Characteristics of the juvenile and adolescent (late-onset) form are black race, predominance of males, marked obesity, approximately 50% bilateral involvement, slow progressive genu varum deformity, pain rather than deformity as the primary initial complaint, no palpable proximal medial metaphyseal beak, minimal internal tibial torsion, mild medial collateral ligament laxity, and mild lower extremity length inequality. The differences between the three tibia vara groups seem to be related primarily to the age at clinical onset, the amount of remaining growth, and the magnitude of the medial compression forces on the involved side. The infantile-onset group has the potential for the greatest deformity, and the adolescent-onset group has the least. Radiographic Evaluation Standing anteroposterior and lateral radiographs of the lower extremities are necessary to assess pathologic genu varum deformities. Radiographically, fragmentation with a protuberant step deformity and beaking of the proximal medial tibial metaphysis are considered the major features of infantile tibia vara. The changes of the proximal medial tibia are less conspicuous in the late-onset forms and are characterized by wedging of the medial portion of the epiphysis, a mild posteromedial articular depression, a serpiginous cephalad curved physis of variable width, and mild or no fragmentation or beaking of the proximal medial metaphysis. The major deformity that must be differentiated from infantile tibia vara is the physiologic genu varum deformity. It is difficult to differentiate radiographically between these two disorders in children younger than 2 years old. When the radiographic findings confirm the diagnosis, treatment should begin immediately. Orthotic management may be considered for children 3 years or younger with a mild deformity. Approximately 50% of children with this criterion may achieve adequate correction using orthoses. Conservative management in the late-onset forms of tibia vara is contraindicated. The children are too large, compliance is poor, and the remaining growth is too small to allow for adequate correction. The indications for surgical treatment in infantile tibia vara include 4 years of age or older, failure of orthotic management, and moderate to severe deformity. Proximal tibial valgus osteotomy with associated fibular diaphyseal osteotomy is the procedure of choice. Brooks WC, Gross RH. Genu-Varum in Children: Diagnosis and Treatment. J Am Acad Orthop Surg. 1995 Nov;3(6):326-335. Ballal MS, Bruce CE, Nayagam S. Correcting genu varum and genu valgum in children by guided growth: temporary hemiepiphysiodesis using tension band plates. J Bone Joint Surg Br. 2010 Feb;92(2):273-6.